There was a great sage in India called Vyâsa. 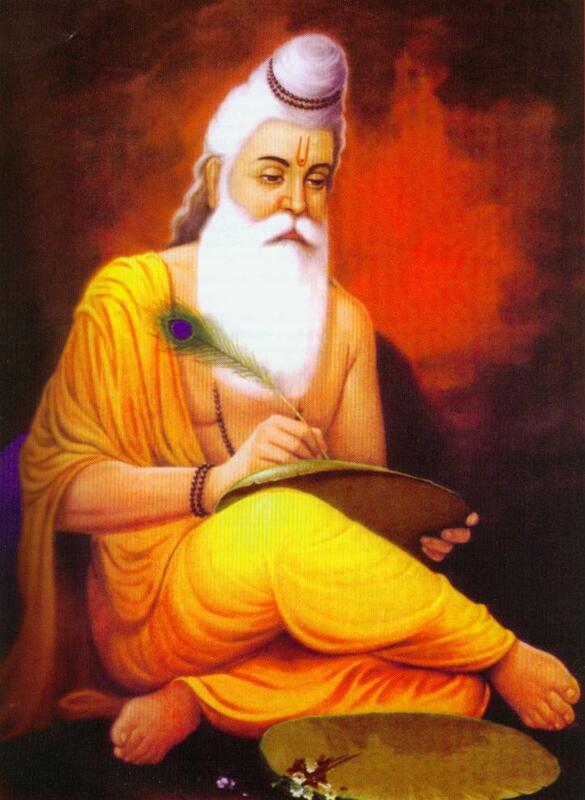 This Vyâsa is known as the author of the Vedanta aphorisms, and was a holy man. His father had tried to become a very perfect man and had failed. His grandfather had also tried and failed. His great-grandfather had similarly tried and failed. He himself did not succeed perfectly, but his son, Shuka, was born perfect. Vyasa taught his son wisdom; and after teaching him the knowledge of truth himself, he sent him to the court of King Janaka. He was a great king and was called Janaka Videha. Videha means "without a body". Although a king, he had entirely forgotten that he was a body; he felt that he was a spirit all the time. This boy Shuka was sent to be taught by him. The king knew that Vyasa's son was coming to him to learn wisdom: so he made certain arrangements beforehand. And when the boy presented himself at the gates of the palace, the guards took no notice of him whatsoever. They only gave him a seat, and he sat there for three days and nights, nobody speaking to him, nobody asking him who he was or whence he was. He was the son of a very great sage, his father was honoured by the whole country, and he himself was a most respectable person; yet the low, vulgar guards of the palace would take no notice of him. After that, suddenly, the ministers of the king and all the big officials came there and received him with the greatest honours. They conducted him in and showed him into splendid rooms, gave him the most fragrant baths and wonderful dresses, and for eight days they kept him there in all kinds of luxury. That solemnly serene face of Shuka did not change even to the smallest extent by the change in the treatment accorded to him; he was the same in the midst of this luxury as when waiting at the door. Then he was brought before the king. The king was on his throne, music was playing, and dancing and other amusements were going on. The king then gave him a cup of milk, full to the brim, and asked him to go seven times round the hall without spilling even a drop. The boy took the cup and proceeded in the midst of the music and the attraction of the beautiful faces. As desired by the king, seven times did he go round, and not a drop of the milk was spilt. The boy's mind could not be attracted by anything in the world, unless he allowed it to affect him. And when he brought the cup to the king, the king said to him, "What your father has taught you, and what you have learned yourself, I can only repeat. You have known the Truth; go home."